You have to feel for any band opening for a Rory Gallagher show; at the best of times Rory fans will not suffer fools or well meaning opening bands lightly; at this year’s Rock On The Tyne Festival, the hard-working Dr. Feelgood was drowned out at the end of their set by audience howls of “Ro-ry, Ro-ry.” This, after a year or so away from the limelight for the shy Irish virtuoso! 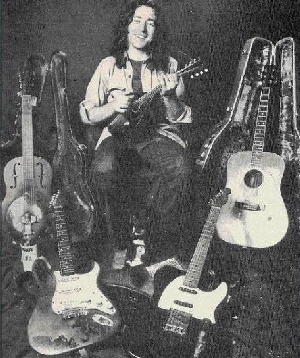 It seems to be a word-of-mouth phenomenon – several years after my Rory Gallagher story appeared in CREEM, I still get cryptic letters and telephone calls; I’m often pulled aside for intense discussions in clubs by Rory fans who spend years between gigs in their hometowns playing the albums and turning on other people to him. Who inspires this emotional bond? He started out on the road as a working musician at the age of 15, founded Taste, one of the archetypal 60’s power trios, in 1966, broke up the band as a result of the inevitable “artistic differences” that would result with such a strong lead guitarist, and launched his solo career in 1971. He prefers to keep his band down to bass, drums and himself – dabbling with brass arrangements, playing a variety of other stringed instruments like the dobro, mandolin, or steel guitar – mostly on records. When he tours, he tours relentlessly, from the huge festivals in the U.K. where he can pack in thousands, to small clubs in the hinterlands of Canada, where he will be mobbed by a frenzied few hundred loyalists. He is said to be the last great British blues guitarist, but to peg him as that would be to limit him. 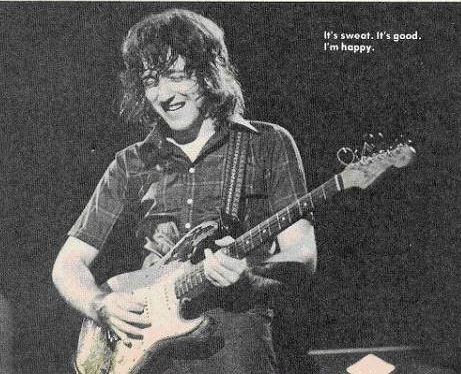 Technically, Rory is a guitarist’s guitarist; his 1960 Stratocaster seems to be as much a part of his body as his arm, or his flannel shirt. He is capable of just about any special effect you would want; he’s an accomplished bottleneck player (wielding a wicked Coricidon D bottle), is adept at playing classical or “freak” harmonics, knows the difference between out of phase and out of phase…but his real brilliance as a musician lies in his refusal to “push buttons” to get preconceived sounds and effects. He’s been in, out and around his guitars so much that he knows exactly what will cause what; it’s in bending something to get something entirely new, changing the rules or throwing them out altogether that Rory is at his best. It’s not a matter of improvisation so much as being in total control of the guitar, knowing absolutely that this quirky move will produce that neat “messed-up” sound. He’s always resisted the idea of being a rock-star – he’s said that he feels it would make playing every night for the hell of it impossible. Yes, he really likes to play. But in a story published just after August’s Rock On The Tyne festival, Rory expressed a recurrent hope – that he would make a bigger splash in the States this time around. With a January release planned for his next album (at least in the U.K.), there’s a chance, even if Chrysalis muffed their chance to unleash a live album on the States – pre-Pat Travers and George Thorogood – and clean up. Maybe?